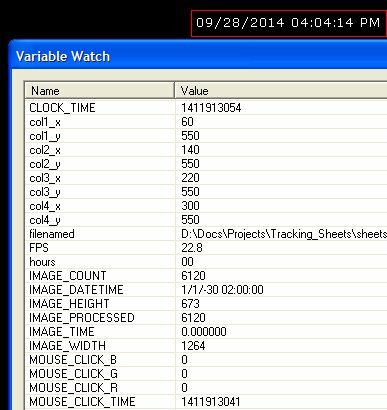 I am using RR without a camera, but in this case the IMAGE_DATETIME does not update. Is there any way to get access to the computer clock without a camera attached? Do you need more resolution than seconds? We can add a CLOCK_TIME variable if that's the case. That would be perfect. I only need seconds resolution. Although I do need to use this as an input variable in the 'Format_DateTime' module to change the order. CLOCK_TIME now available in the latest version. The format used is the number of seconds since Sept 2001 (or some other date depending on your OS). That is the easiest format to work with since any math on the time is easy to do. In order to get an actual printed date, you can use the format date module which understands that time. Or just use the Format_DateTime with a blank input variable and it will use the current time as the source. Perhaps this is really what you needed regardless. Or were you looking for something different? Also, I assume you've set the Min Processing time in the options dialog to run the pipeline without having the camera activated? If not, the time will just stick and not increment until the pipeline needs to run. Yes, I have set the minimum FPS, but I did not know about the blank input variable. Really sorry I missed that line in the documentation. So leaving the variable blank is exactly what I need. Thanks. No worries ... I even missed that too! We've added in a small text note in that interface to remind people of that capability. So thanks for bringing it up! It seemed weird that it wouldn't have such a default action but it turns out it already does just not indicated well enough!